Product prices and availability are accurate as of 2019-04-09 23:10:42 EDT and are subject to change. Any price and availability information displayed on http://www.amazon.com/ at the time of purchase will apply to the purchase of this product. Desktop functionality in an affordable Network-Ready Device Print, Copy, Fax, Scan and Network using the imageCLASS® MF4370dn Networkable: The imageCLASS MF4370dn delivers large-office network capabilities in an affordable compact package. 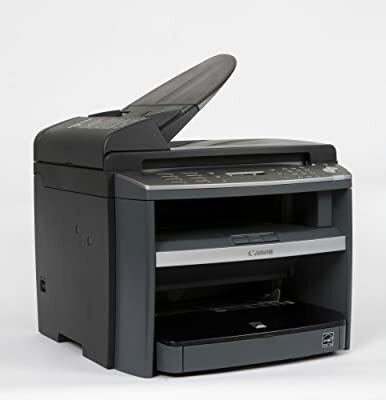 It can be connected over an Ethernet, so everyone can easily share printing, PC faxing and scanning directly from their PC. Smart Paper Handling: The MF4370dn boasts print and copy speeds of up to 23 pages-per-minute (ppm) for letter-sized output, and delivers Quick First Prints or copy pages in approximately nine seconds. It has the versatility to duplex print directly from a PC as well as duplex print incoming faxes and copy letter-sized documents, helping reduce paper consumption in the home or office. Through the device's 35-sheet automatic document feeder (ADF), the unit will also copy single-sided documents and output double-sided pages for quick and efficient workflows. Multifunctional: The imageCLASS MF4370dn capture scans in a 24-bit color at an interpolated resolution of up to 9600 dots-per-inch (dpi) through its ADF or platen glass. The new device transmits documents seamlessly and quickly with Super G3 Fax, reaching speeds of approximately 33.6 Kbps. Single Cartridge System: The MF4370dn also incorporates the Canon Single Cartridge System, which combines the toner and drum in one easy-to-replace unit, resulting in excellent image quality retention and eliminating the complication and warehousing of separate toner and drum consumables.